I am in the process of researching a biography of the poet Elizabeth Gibson (later Elizabeth Gibson Cheyne). In the meantime, as there is so little publicly available information about her, I have decided it would be helpful to publish some brief details of her life and writing. I will be adding more at a later date, including fuller details of all books and a list of her publications in periodicals. I would be glad to hear from, and share information with, anyone who has come across her in the course of their own research. Download this page as a Word file or as a pdf. Poet and writer Elizabeth Gibson (later known as Elizabeth Gibson Cheyne), wrote approximately forty books of prose and poetry between 1899 and 1918 (see list below). During her lifetime her poems also appeared in publications ranging from mainstream journals to the little magazines of literary modernism, from the radical press to publications by Theosophists, Freemasons, and Ethical Societies. Though her books had limited circulation, they were noticed in the Times Literary Supplement as well as tiny specialist journals. Her poems were quoted by social reformers, set to music, used in alternatives to traditional religious services, and read out at protest meetings. By the end of the First World War, however, her work was largely forgotten. Elizabeth Gibson was born in 1869 into a large family in Hexham, Northumberland, where she lived for the first forty years of her life. Her father, John Pattison Gibson, was the town chemist, notable also as a photographer and antiquarian. Elizabeth attended Gateshead High School before working as a day-governess and typist. She was also responsible for helping to educate her younger brother Wilfrid Gibson (1878-1962) who was strongly influenced by her and also became a poet. 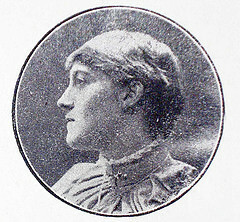 Her relationship with Wilfrid remained one of the most important in her life. She had a turbulent personal life, loving both men and women. Following a broken engagement in around 1909, she had a mental and/or physical breakdown. In 1911 she married Thomas Kelly Cheyne (1841-1915) a leading Biblical scholar, and moved to Oxford. As well as a shared commitment to social change, she and her husband both challenged religious orthodoxies, searching for truth in all religions, interconnections rather than differences. Thomas, while still an ordained Anglican priest, became a member of the Bahá’í faith soon after their marriage, but Elizabeth, though profoundly religious, continued to reject organised religion. Elizabeth called herself a suffragist, a socialist, and a freethinker. She supported the militant suffragette organisation the W.S.P.U. (Women’s Social and Political Union) and was a member of the Women Writers Suffrage League. In 1914, following the outbreak of the First World War, she was one of the signatories of the Open Christmas Letter to the Women of Germany, calling for women internationally to unite for peace. However, some of her later poems indicate that she came to change her views on the war. After her husband’s death in 1915, she moved to London, where she worked as a volunteer visiting wounded soldiers. She became interested in Spiritualism under the influence of Bishop Basil Wilberforce and founded a group called The Order of the Spirit. She published her last book in 1918. Following a deterioration in her mental health, she was admitted to Bethlem hospital in 1920, moving the following year to Camberwell House Asylum, where she remained a patient until her death in 1931. She is buried in Oxford, with her husband. Elizabeth Gibson is born in Hexham, Northumberland. Her brother Wilfrid Gibson is born. She begins to publish her poems in magazines. Her first book, The Evangel of Joy, is published. She is involved with the W.S.P.U and the Women Writers Suffrage league. The census gives her occupation as author. In August she marries Thomas Kelly Cheyne, and moves to Oxford. Her husband dies and she moves to London, where she works as a volunteer visiting wounded soldiers. She publishes her last book, The Wilderness Shall Blossom as the Rose. She is admitted to Bethlem hospital. She moves to Camberwell House Asylum, where she remains until her death. Note: Until 1912 her books were published under the name Elizabeth Gibson, after that under the name Elizabeth Gibson Cheyne. Another book, The Book of the Beloved, appears on a 1902 list of her previous publications. However, no copies or other reference to its existence have yet been located. Any information gratefully received!